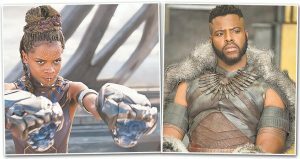 Among the shining stars of this weekend’s opening of the Marvel Studios’ superhero movie “Black Panther” were Letitia Wright from Guyana and Winston Duke of Tobago, who gave notable performances in the Hollywood blockbuster. The pair are riding the success of the anticipated film, which had record-setting advance ticket sales and is in the middle of an impressive four-day President’s Day weekend debut. Based on the Marvel comic book series that started in the mid-1960s, “Black Panther” stars Chadwick Boseman, Michael B. Jordan, Lupita Nyong’o and Danai Gurira. Wright, 24, was born in Guyana. While a child, she moved to London with her family. She plays Shuri, the sister of T’Challa, the prince who becomes ruler of the fictional African kingdom of Wakanda and reigning Black Panther — the country’s masked superhero protector. Wright’s Shuri is passionate, intelligent, technologically intense and — like the other female characters in “Panther” — well equipped for intense physical combat. Duke, 31, portrays the powerful leader M’Baku, whose Jabari Tribe lives in far-flung mountains away from urban Wakanda. One of People magazine’s “Hottest Rising Stars” and the focus of a Vanity Fair article titled “Black Panther’s Winston Duke Is the Star You Should Be Watching,” the Tobago-born actor came to the U.S. with his family when he was 9 years old. He attended Yale School of Drama, became friends with fellow student Nyong’o, and both were members of Yale’s “Folks” club, co-founded by Yale alumnus — and fellow “Panther” actor — Angela Bassett for student actors of color, according to the Vanity Fair article. In a “Black Panther” post-credit scene, Wright gives audiences a peek into the upcoming the Marvel superhero movie, “Avengers: Infinity War.” Along with Boseman and Gurira, Wright and Duke appear in the Avengers sequel, which opens in May.